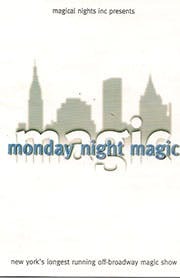 Magical Nights Inc, presents New York's longest running off-Broadway magic show, Monday Night Magic. Each week you'll find a different array of the finest stage magicians performing world class magic in an intimate theatrical setting. The on-stage magic continues during intermission as sleight of hand magicians mingle with guests in the Close Up Gallery downstairs as well as in the theater. Monday Night Magic performers have been featured on numerous television shows, including Good Morning America, the Early Show, Today Show and most recently on The Wall Street Journal Report.